I thought that I would kick this week off with a reveal, one that I know a lot of you have been patiently waiting for. 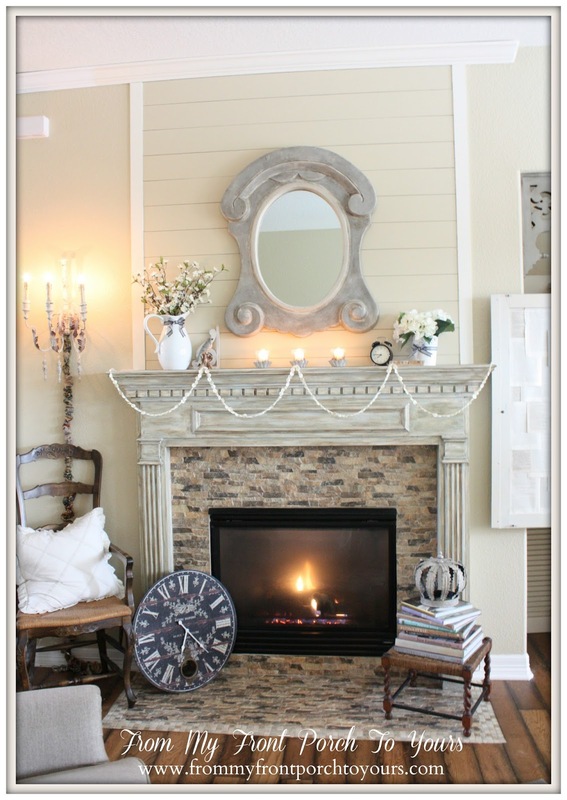 It has been about two months since Mr. Front Porch and I tackled our DIY Wood Beam project for the living room. The project took us approximately 2 weeks to complete. We mainly worked on it during the weekend. I thought that I would include a few Before pics. 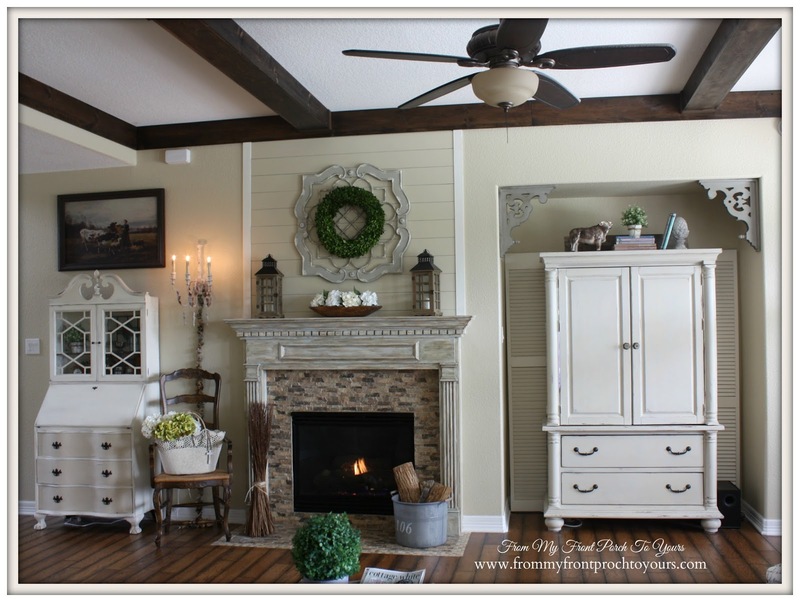 If you stop by my French Farmhouse Living Room Reveal post from a few years back you can see more Before pics. I wish there had been better lighting today. It is so hard to take pictures of this space because of the three windows. I love um but hate um. It did not help that it was overcast today which makes the room look much darker than it really is. One of the fears we had while installing the beams was that the beams were going to make the space seem smaller and the ceiling lower. We were amazed though at how large they actually make the space feel! The difference in the space is just amazing and we wish we would have completed the project years ago instead of hemming and hawing over it. I had already added wood toppers to our doors and windows some years ago so we knew we could make the beams to match but kept thinking we were going to maybe order some faux wood beams. After pricing them out and looking at them we decided making our own was the only way we could get exactly what we were wanting. It feels so cozy and inviting in here now. We decided on two beams because we have three archways into the kitchen and wanted to stay in keeping with those. 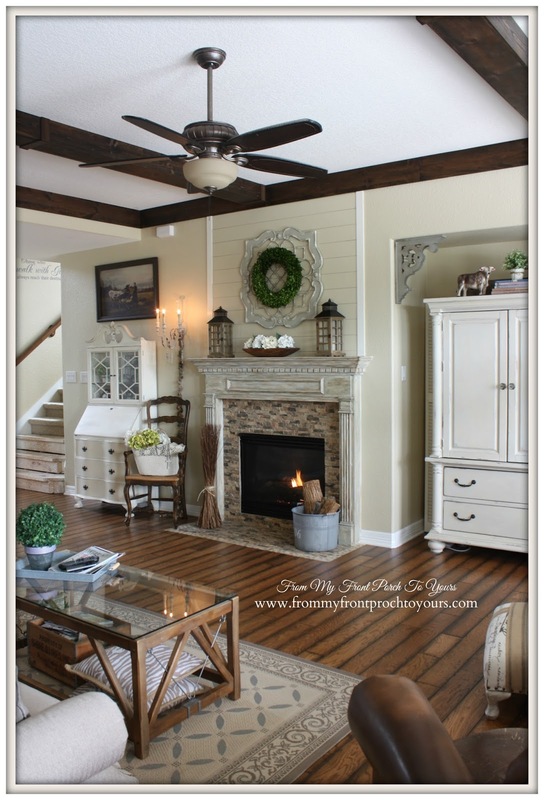 The beams add the perfect farmhouse touch to our home that we were looking for and finish off the fireplace perfectly. 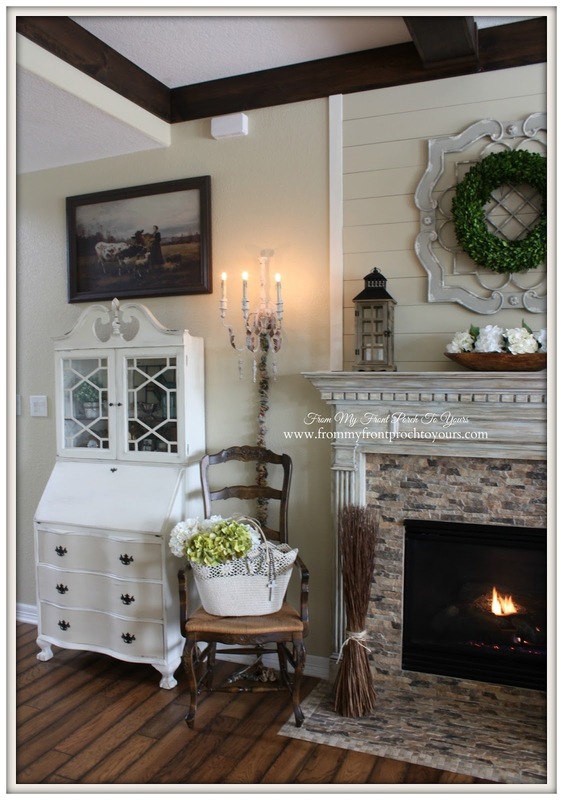 It was in the 80s today but I thought the fireplace added a nice ambiance for the reveal pics. This project though a tad time consuming, was fairly straightforward and easy. 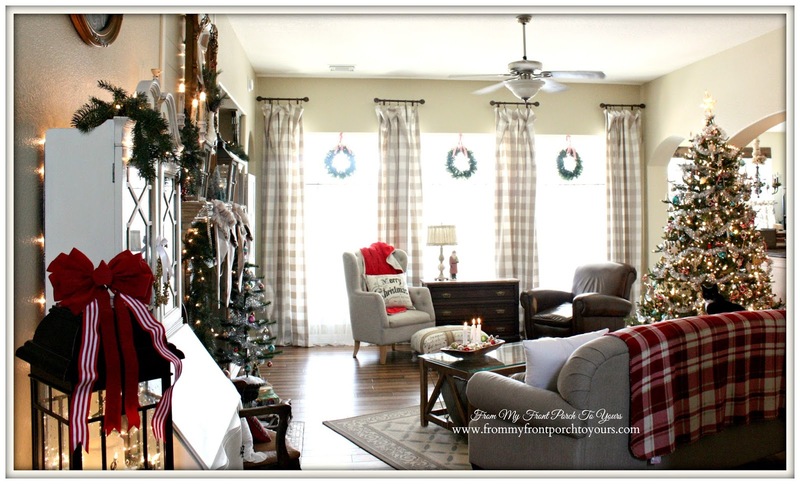 I will be sharing how we created them and hung them so be sure to stop back by this week. Before I go I just could not resist including pic of my sidekick. She slept on the couch the entire time I took pics of the living room. It was not till the end that she woke up. Our wood beams tutorial is now up if you are interested in seeing how we made them. LUV!!!! Well worth the wait Pamela. The perfect addition to your beautiful living room. these are wonderful! 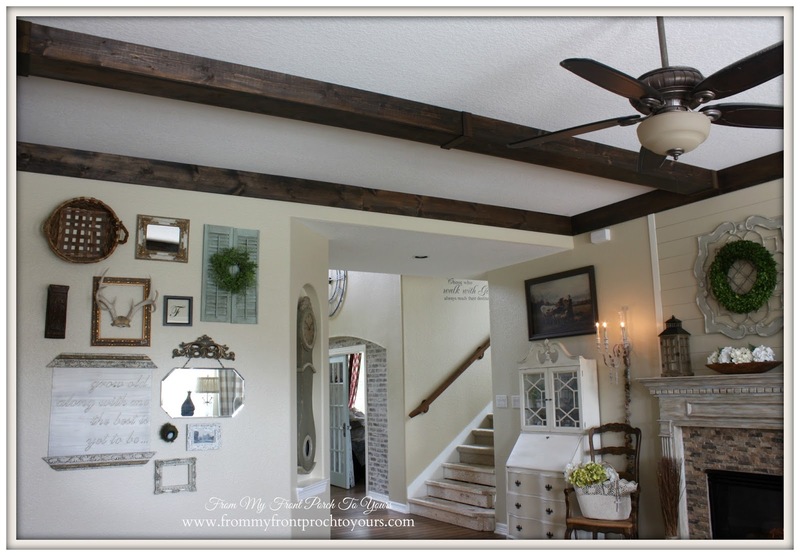 You've done two things in your house that I would love to do in mine - your faux old brick and now these wonderful ceiling beams. Looking forward to your tutorial! It looks great! Thank you Lynda! I think the tutorial will be up on Friday if not sooner. Love the beams! The whole room is amazing! gorgeous!! You guys did an amazing job! I have beams in my living room and I love them, too. Great job! Thank you Deserae! I knew you would like seeing my cutie pie! We sure love our fur babies. Julie thank you so much girly! This turned out absolutely D-I-V-I-N-E. It is just gorgeous. The wait was well worth it. The beams are gorgeous. What a perfect addition. It definitely gives the room much more character. Love it. Thank you Marty! They were the perfect addition. It surely turned the room around Pamela! 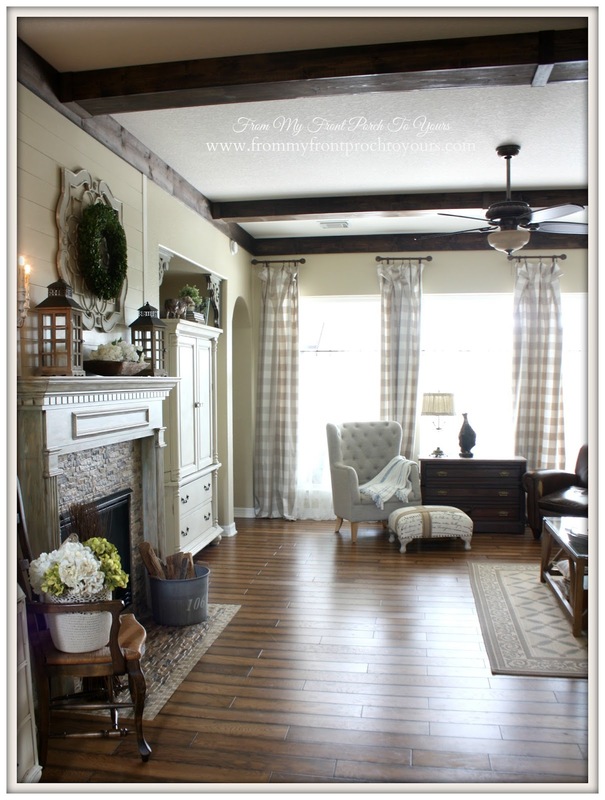 Those beams add so much character to your already beautiful home! Absolutely LOVING the beams!! So much charm!! And I want your chair!! Where is that one from?? Thank you Lori! I sent you an email about the chair. It came from HomeGoods a few years back but they still get them in . Sooooo beautiful Pamela. 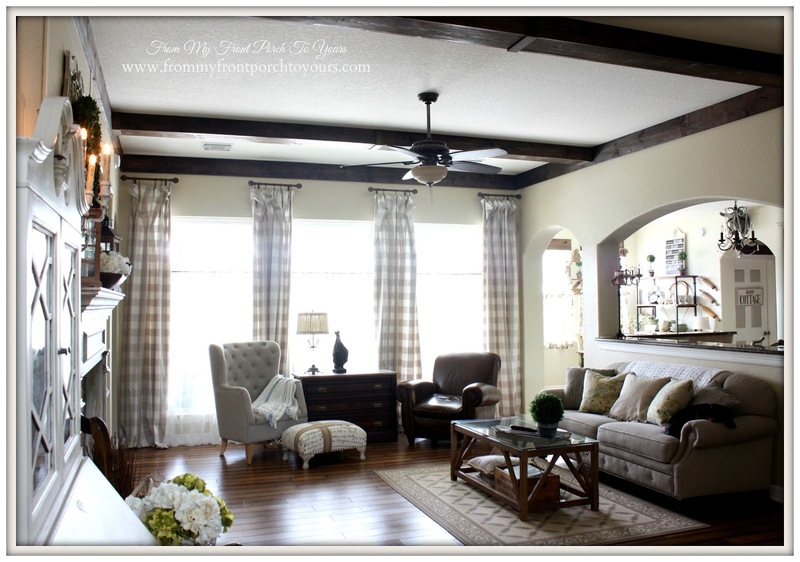 Wow what a beautiful statement those architectural beams make for your room. Gorgeous. Love your floors in there too. The room is very inviting and cozy. Great job. 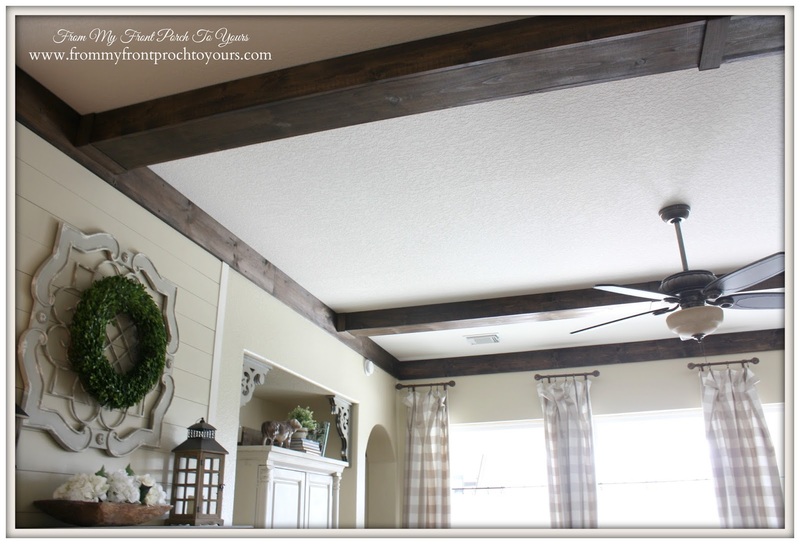 The beams really added a ton of character to your room. Love them! Thank you Lisa! We are enjoying them immensely. They turned out wonderful and I can't wait to see how you did it! I hope you can also include approximate costs, because we have been looking at the faux beams as well. they're just gorgeous! wow, what an amazing change, they add so much farmhouse charm! Thank you Debra! They do add so much charm to the space. I love the beams, Pamela. I love beams anyway and wish we had some. Hubby says no! They look awesome!! I want some! Your sidekick is a cutie!! LOVE LOVE the beams Pamela...you guys did an awesome job! These look awesome. The wood look so rich against the white ceiling. 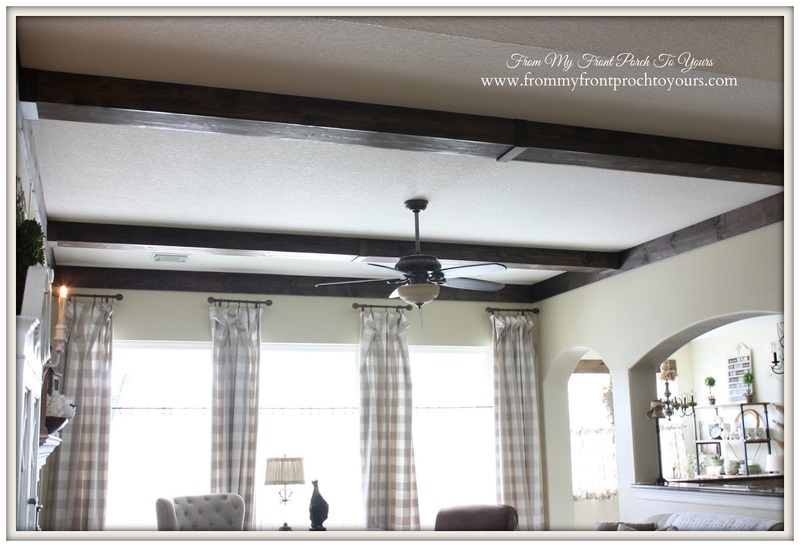 I have a tray ceiling in my dining room...and I am thinking about putting beams in the tray. 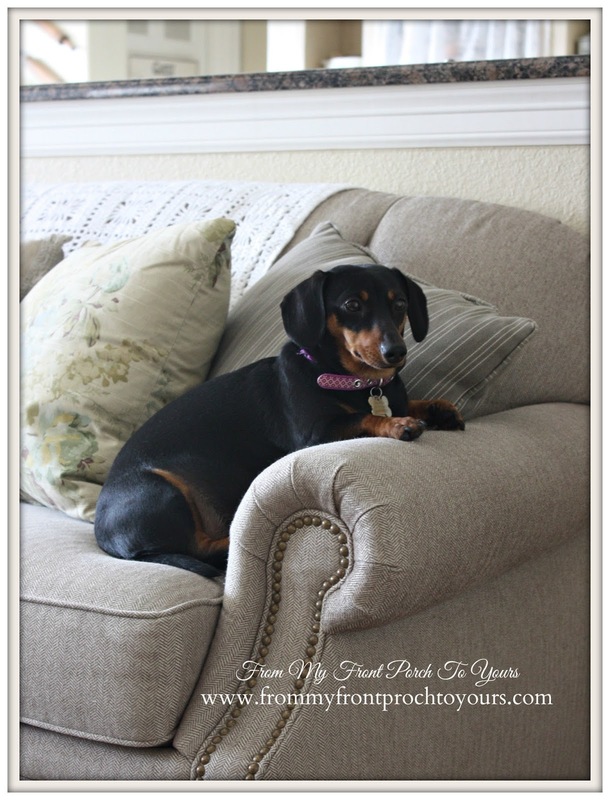 Thanks so much for sharing your beautiful living room. Love the beams Pamela. They are such a great addition to your beautiful living room. So happy to have you share at AMAZE ME MONDAY! This DIY project turned out GREAT!! They make such a huge statement in this room and will be a big plus when it's time to sell. Thank you for sharing at my Show and Share Party. Gorgeous!! Simply gorgeous!! 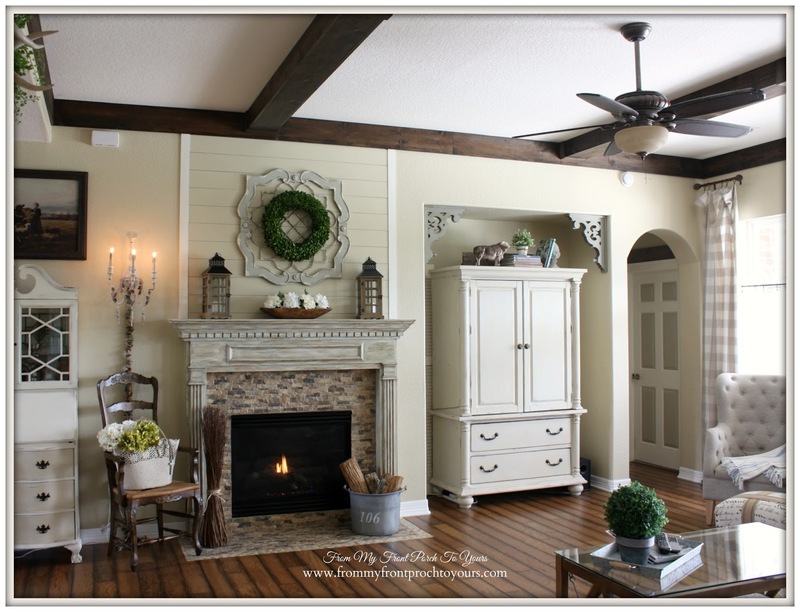 Though timeless, the beams give your home/room a sense of history. Pamela, you are an amazing decorator! I'm in awe... and don't apoligize one bit for the light... it's perfect! WOW Pamela, it looks like a different room, I love it! I have always wanted to add beams,I just don't know how they would look with the white crown, I'll have to find some pictures! Thanks for sharing this, can't wait to see the tutorial! They look great, Pamela! What a difference and I love how it looks! So beautifully done. I will send you pics of my room.....when I copy your great idea. LOL.. Thanks so much for sharing. Great job. Wow! Beautiful!! I love the floors as well! Would you mind sharing what kind flooring you used? Thank you! The floors were a DIY about 5 years ago. They are engineered hardwood from HoeDepot by Thomasville. I forget the em of it. Sadly they no longer make it. You'd swear they were built with the house Pamela - they're just perfect - what a gorgeous room !!! They look stunning Pamela! You and your husband did an amazing job! This is absolutely stunning! I am in awe! May I ask where you got the piece that is above the mantel that the wreath hangs on? Thank you Jamie. The piece I purchased from HobbyLobby but Kirklands also carries it.